SafeRack is proud to carry Smart/Tech, Newson Gale and Civacon ground verification and monitoring products. Our out-of-the-box solution ensures your truck is properly grounded before loading begins, protecting your employees and property from accidents caused by static sparks. Newson Gale has been developing industry-standard grounding systems for over 30 years. SafeRack is proud to partner with such a respected safety brand and carry many of its products (including its award-winning Earth-Rite series). Effective grounding and bonding ensures safe dissipation of static electricity to prevent fires and explosions that can be ignited by static and you can protect yourself and your employees with the Earth-Rite PLUS®. 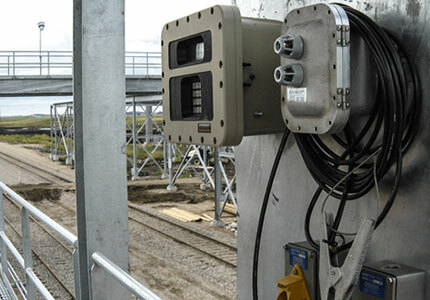 It provides positive verification of static ground connection on a wide range of industrial plant equipment, including tanker trucks, railcars, drums, containers and other conductive equipment. Civacon is a branch of OPW Global specializing in grounding and monitoring safety products. Its product set compliments that of Smart/Tech and Newson Gale, allowing SafeRack to offer a comprehensive suite of grounding and monitoring solutions. The 8460 Opti-Therm Overfill Detection System recognizes the signal technology on the transport, verifies grounding, and communicates with the terminal automation system (T.A.S). The 8460SRC is a direct replacement chassis upgrading other systems with a simple drop-in technology. Cane probes are used to provide overall detection where a permanent sensor cannot be properly affixed to a tank or railcar. They provide a portable, flexible solution to meet a variety of overfill requirements for safe top loading. Cane probes utilize modern, instant-on optic principals. Adjusting the sensor position with a large adjustment knob on the cane probe clamp easily sets the sensing point. CIVACON™ brand plugs and cords are used with junction boxes to connect the overfill detection monitor to the tank transport at the terminal. We offer two types of systems: optic (blue, 6-pin) and thermistor (green, 8-pin).